Furuya, U. (2010, October). Genkaku Picasso [Manga]. Shonen Jump, 8, 14-41. Monthly Manga News. (2010, October). Shonen Jump, 8, 276-277. Avid manga fans will not only be running to the library for each monthly issue, but youth services librarians will have a hard time keeping this magazine on the shelf. 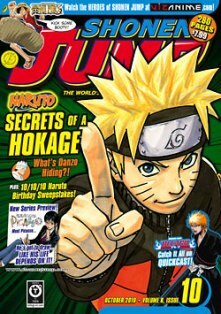 Shonen Jump is a monthly magazine that brings new chapters to US fans from long-running Manga series and introduces new popular series from Japan as well. For readers who are unfamiliar with Manga, “Shonen”, in Japanese, means elementary to high school aged boys so all of the Manga in this magazine is perfect for ‘tween boys. The topics of each story vary as well as the genre so ‘tween boys will have plenty to look forward to in each monthly issue. Moreover, readers will get the opportunity to read brand new chapters of their favorite series before new volumes are released in bookstores and libraries. Another great aspect to Shonen Jump is the freebees! Some of the issues release goodies such as “Yu Gi Oh!” playing cards, artist interviews and anime news. Readers can also access the Shonen Jump website that also contains more stuff such as: desktop wallpapers, e-cards, games, and access to online Manga. Although patrons will not be able to access the online features of this site, they can easily purchase their own subscription. However, the goodies that accompany the magazine can be used as giveaways for ‘tween programs. This 'zine will appeal to all Manga fans, especially the "Naruto," Bleach" and "One Piece" fans (these series will never end). Moreover, fans will get monthly news in regards to anime releases, video game reviews, and artist interviews. These magazine will work great in any 'tween collection or in part of an anime/Manga program.